Simply the best RV over-the-air HDTV antenna available. 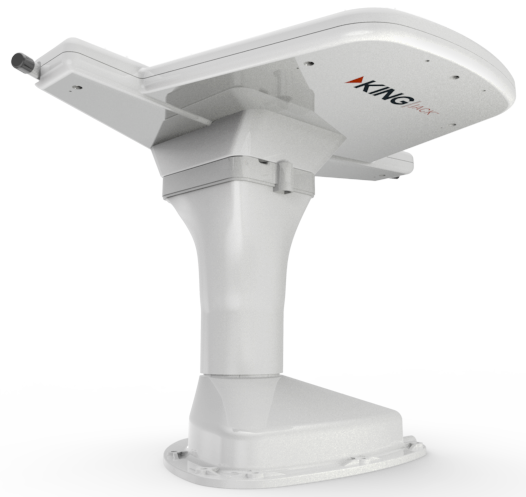 The KING Jack antenna is simple to install and even simpler to use. Wider Reception Range. Less directional than traditional RV antennas to provide broader reception coverage. Greatly Improved UHF Reception. Superior reception of UHF signals where over 80% of new DTV channels are broadcast, also offers great reception of remaining VHF channels. Easy to Install. Works with varying roof thicknesses and easily replaces existing antenna. Effortless Antenna Rotation. 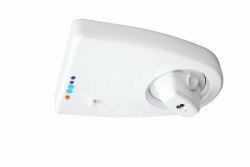 Easily rotate antenna with two fingers with 360 degree rotation for no dead spots. 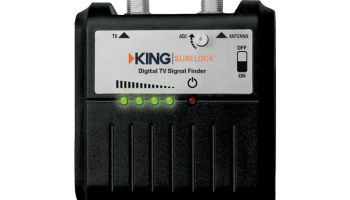 Built-in Digital TV Signal Meter. Point the antenna for maximum reception before scanning for channels to simplify setup and eliminate frustration. No Crank Handle. Fixed height requires no cranking up or down. No need to remember to stow antenna before driving away. Compact, Aerodynamic Design. Aerodynamic mount offers superior wind resistance, is 70% smaller and requires less roof space than traditional RV antennas. Q. My head is pointed in the opposite direction of the arrow. A. When the antenna head is positioned correctly, the flat side of the antenna head will be toward the signal source. The arrow molded in the positioning knob will actually point away from the signal source. Q. Can I rotate the base mount of the KING Jack to cover up the holes left by my old mount? A. No, the base of the KING Jack mount needs to be facing forward or the mount can possibly leak water. The MB8000 Bracket (sold separately) is recommended for covering up holes left by removing the previous antenna. Q. How do I extend the adjustable connector from the shaft? A. Simply pull down on the adjustable connector, it may take a bit of force.